Take a walk around your neighborhood. Chances are you or someone in your community has sago palms in their yard or home. Rugged and beautiful, these plants are a common choice among landscapers and homeowners alike. Despite their aesthetic appeal, sago palms can spell big trouble for children and pets. Every part of these plants are extremely toxic, causing severe liver damage and possibly death if ingested. According to Better Homes & Gardens, sago palms are not true palm trees as their name and appearance would suggest. They are tropical and prefer warm climates, but are actually members of the cyad family which dates back to prehistoric times. Since they are hardy and low maintenance, many people choose to plant sago palms, unaware of the dangers they pose. According to the ASPCA’s Animal Poison Control Center, there has been a 200% spike in sago palm toxicity cases since 2015, with up to 75% of those cases resulting in fatalities. This is likely due to the increasing popularity of the plants in northern states where there is less awareness of their risks. “It used to be that we only got calls from places like Texas, Florida and California, but about three years ago we started seeing cases pop up other places,” says Animal Poison Control Center Medical Director, Tina Wismer. What are the symptoms of sago palm poisoning? Around this same time, severe liver failure begins to take hold. At this stage, dogs will continue to have gastrointestinal and neurological symptoms as well as lethargy, abnormal fluid accumulation in the abdomen, abdominal pain, jaundice, increased thirst and urination, bruising, and black-tarry stool. If the dog is brought in for care before symptoms appear, veterinary staff may be able to induce vomiting and give activated charcoal to absorb the poison. 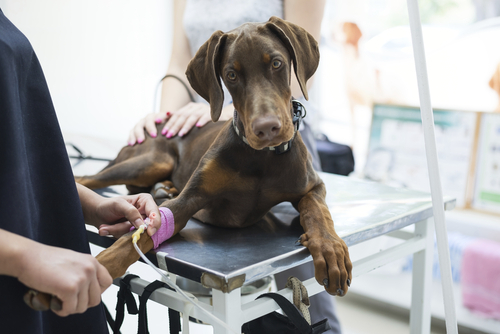 Once physical symptoms are present and the dog’s blood shows signs of liver disease, more aggressive measures are necessary. This includes hospitalization with fluid therapy as well as blood or plasma transfusions. Sadly, even with aggressive treatment, the survival rate of sago palm toxicity in dogs is only about 50%. If you think your dog may have ingested sago palm, call your veterinarian or the ASPCA Animal Poison Control Center at 888-426-4435 immediately! When it comes to your beloved pup’s life, it is always better to be safe than sorry.